Home » Keeping Your LinkedIn Profile Edits a Secret! Keeping Your LinkedIn Profile Edits a Secret! This article is up to date as of 2018. As a LinkedIn Profile Writer, my days are spent helping professionals optimize their LinkedIn profiles so they can put forth a professional and polished image that attracts opportunity like moths to a flame. Often I am asked by my client if it’s possible to cloak our edits so employers aren’t tipped off that changes are being made. 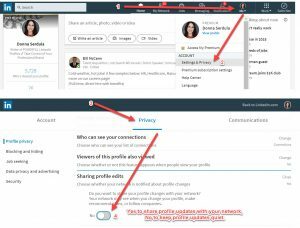 When you make changes to your profile, an update is sent out to your network alerting them that a change was made to your LinkedIn profile. These updates are a great way to stay top of the mind aware with your LinkedIn connections. In fact, I frequently tell clients to make edits to their profile at least once a month so they are assured placement in the weekly LinkedIn Update email that goes out to their connections. Regardless of the benefits, there are times when you don’t want people to know you are making changes. Perhaps you are updating your LinkedIn profile in the quest to find a new job. It’s probably best your employer isn’t notified of such a change. Luckily, LinkedIn provides the ability to turn off your Activity broadcasts so you can make changes to your LinkedIn profile without alerting your connections. Click your image in the upper right-hand corner of your screen. Toggle the switch to No. If you find these directions too difficult, just click here -> Turn on/off your activity broadcasts. This will take you to the old setting page where you can remove the checkmark and click save. 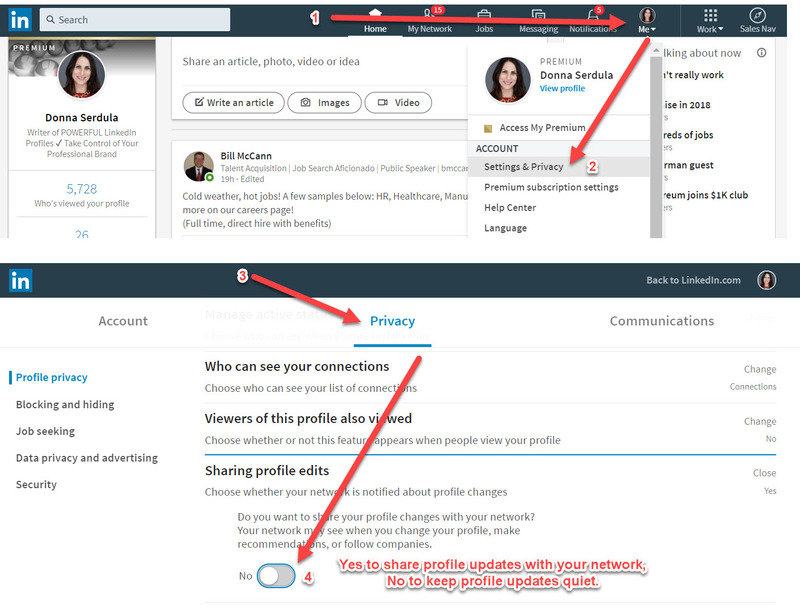 Once you are finished making changes to your LinkedIn profile, I highly suggest turning the sharing profile edits option back on! All you need to do is follow those steps but toggle yes at the end. NOTE! Turning off your Sharing Profile Updates doesn’t turn off the broadcasting of Groups you joined. If you want to join Groups anonymously, there’s a hidden setting to turn off notifications when you join a LinkedIn Group. Oh no! 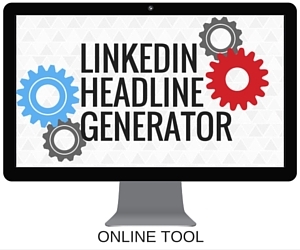 Did you mistakenly tweak your profile and those edits are listed in your LinkedIn activity? Don’t panic, just delete them! A drop list appears, under Manage, click Posts & Activity. Find the update you want to remove and click the three dots in the upper right-hand area and click Delete Post. That activity will be deleted. It’s a new world out there and many people still don’t get it. If you are ever confronted by an employer for having an optimized LinkedIn profile or for being active on LinkedIn, it’s important to use this as a teaching experience. Let the person know that LinkedIn is above all else a professional networking site. LinkedIn offers a perfect way to connect with professionals, prospects, clients, vendors, business partners, etc… NOT JUST RECRUITERS! LinkedIn offers a visual, digital business card and career profile. By optimizing it, you are making sure you are found by the right people and are projecting the right, unique image which will reflect positively on your company. I wish you the best of luck and if I can ever be of any assistance, please contact me! interesting article- though i’ve found even with my activity feed setting “visible only to me” and my activity broadcasts turned off, my connections are still seeing when i join groups and occasionally other activities… it would be nice to know how to go completely silent. How do you REMOVE specific updates you no longer want? That is the issue with me. Thanks!!! This helped me a lot, thanks Donna! This is a hugely non-friendly user site loaded with redundant password demands and incredibly confusing and hard to find setting changes. You have to become a near-expert to control what you do here, which I definitely am not interested in. Hence, I, like many here, are sending and receiving alerts and announcements we don’t care to send or receive. I also find it incredibly invasive and almost creepy that somehow I’m being hooked up with certain people I care not to “link” with. It makes me wonder, what is being put out there to others I can’t see? I mean, seriously, there are connections Linked encourages me to link with that honestly, has nothing to do with business or family. Again, it’s invasive and makes me feel as if I have zero control. Then it suggests people I may want to hook up with, and after clicking one or two, find myself back at the log in page. Then it shows the same people I may wish to connect with. Totally infuriating and not user-friendly. And let’s not forget this is the website that got hacked by amateurs two years ago and all members had their passwords stolen. Then they send a message out to members like, “Your information is secure with us. However due to a recent breach you may wish to change your password.” Oh really? How is it, if they stole my password, that my information is “secure”? And what if I used a similar password for my banking let’s say, how is it I should not feel violated? A crappy website. I wanted to change my settings so that I dont all my first connections notified when I connect with someone new. I followed the instructions above but my connections still receive notifications. I don’t like the way that LinkedIn includes my recent connections in the weekly round up. As an independent consultant I don’t necessarily want to broadcast when I connect to new clients. Event though I have turned off my activity broadcasts my new connections still seem to appear in other people’s weekly round up. Is there a way to stop this happening? Very helpful article — thanks! I found your Group Broadcast comments a little confusing; could you please clarify? Specifically, you state that, “Turning off your Activity broadcast updates doesn’t turn off the broadcasting of Groups you joined.” Immediately afterwards, you discuss joining groups anonymously by manually removing the update. My confusion — If my activity (joining a group) is broadcast no matter what, it seems like the damage is already done at that point (at the time I join). In other words, if notification of the group join is sent at the time that I join, then removing it from my timeline only keeps it off my timeline — it doesn’t keep others from being notified that I joined a new group. Or am I missing something? I don’t know who put my name in and done a profile for me. My profile and my details to be removed from LinkedIn members lust. I don’t even have any password. Regrettably LinkedIn apparently always broadcasts change of photo regardless of setting 🙁 “Note: Updating your photo generates an update that cannot be prevented by turning your activity broadcasts off. ” Quite annoying. You are absolutely right– In fact, whenever I update a client’s photo, I immediately check their activity feed and delete the update regarding the new photo. It’s a bit annoying and clearly a bug. Perhaps LinkedIn will fix it. You know what else is annoying? Continuing to get activity feeds from contacts you have explicitly REMOVED. If I make the decision to remove a contact, why in the world would I want to get their activity updates? Why would I want to know that they “liked” somebody’s picture or commented on some silly puzzle or cartoon? I hate LinkedIn, personally. It’s a necessary evil when I am looking for a new job. Other than that, it’s just another massive hole blown in my privacy and makes me feel like I am in high school again. For some reason I cannot see in the activity feed whenever a new connection is added to my account. I see other peoples additions but not my own. I checked all of my privacy settings but nothing works. Can you help? Thanks. As whenever we add a new connection, a message is shared with our connections. So as there any way to hide only such kind of message/post from our connections?